Homepage. This page: Fun childrens book from the early 1960s featuring road transport. Costing just sixpence (6D) in pre-decimalised Britain, the I-SPY Road Transport book would have been a fun book to own in 1961, when children seemed to have much simpler pleasures than today. The I-SPY books were created to keep children occupied, whenever that need arose - whether on holiday or during a car journey, manys the child that kept themself busy trying to spot examples of items that featured in the book. and loads of others - I'd like to find one of each of the motoring I-SPYs if I could, by 1961 there were books on Cars, On the Road, Motorcycles and Cycles, Sports Cars, and Road Making, so I'll have to look out for them. But back to this one, namely Road Transport. It was filled with great line drawings of commercial vehicles that you might spy while out and about. You were encouraged to explore, whether on your own, with a friend, or with the rest of the family. At that time, I-SPY also featured in the Daily Mail, with columns written by Big Chief, for all the exploring little Redskins out there. For every vehicle that you spotted, you would earn a score, based on the rarity of that particular vehicle. For example, you get 20 points if you spot a Flat Platform Lorry (a Commer), 30 points if you saw a Lorry With Double Cab (again a Commer), a whopping 40 points for a Mobile Office, and an eye-watering 50 points if you were lucky enough to spot a Mobile Coal Office. Many of the lorries and other vehicles drawn are easily identifiable as real vehicles. The cover shows a Commer transporter, loaded with Hillman Husky bodyshells on the top deck, and Minx saloon bodyshells down below. Interesting Rootes received a little plug for their Karrier commercials, thanks to the lettering on the Commer's headboard. Smart. Other subjects and vehicles featured in the I-SPY book include a Hovis lorry, drop-side lorry, cattle, builder's & milk lorries, tilt lorry (again a Commer! ), twin ram tipper, Leyland twin steer with 'tri pad' configuration, ferry trailer (AEC), cooked meat, grocer's & butcher's shops, a Thames ET6 mobile dispensary for sick animals (PDSA), mobile library, Austin Loadstar Ventilated Van (25 points), insulated van, low loading trailer with two tractors (Scammells), pantechnicon, parcel van, bulk grain carrier (Thornycroft), Macleans toothpaste display van (as modelled by Dinky), soft drink delivery van, motor coaches, half deck coaches, open top double decker bus, trolley bus, turret broadcasting van, Bedford CA pickup, personnel carrier (Commer again), breakdown vehicle (Bedford I think), transporter, lorry chassis on a road test (! 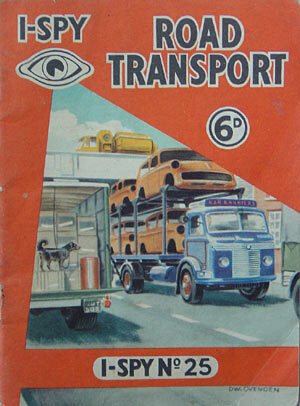 ), cement transporter (Bedford S Series), concrete mixer, and even a van with attendant guard dog!